Champaran is a land of many legends and everything about it carries ancient history in it. Situated on the lower tray of Himalayas’, Champaran land is fertile and farming is the most preferred occupation in the whole region. The legend has it that British exploited the farm productions and imposed unfair regulations on the fellow farmers leading to irreversible damages to the area’s socio-economic status. The imbalances of resources are still evident. Poverty is rampant and residents lack basic amenities to live. Even in such desperate times, the locals bravely negotiate with their lives miseries. The core problem is, that the farmers owns such small farms that the land productions is barely enough for family’s self-consumption. The male population is forced to migrate to Gujrat, Delhi, Maharashtra and other metros in search of some additional income. Although, Champaran looks denuded of every possible comfort in life, it contains two resources in abundance; Khar and kanda. Most of the homes in the area are constructed using mud and both-khar and kanda- is used as water resistant while making roof and walls. During rainy seasons Khar and Kanda comes handy in providing leak proof shelters and provide much needed relief to the natives. Although, scene gets completely changed in summer time. In hot summers, khar and kanda becomes too dry and make huts boiling chambers. To understand the gravity of the situation one needs to dive into the lives of Champaran natives. In this day and age, using LPG for cooking is considered as luxury. Most of the families cook their meals outside house with live fire on their ‘chullhas’ and when high speed air blows during summers, it leads to many fire mishaps as huts easily catch fire. The fire mishaps have become a dark reality of Champaran. It is high time government, community member and other social actors do their bit to tame this fire issue. Soochna Seva Kendra team decided to bring the entire stakeholder on one platform and identify that one solution which can solve this problem once and for all. In the meeting, it was decided to raise funds through public contribution and buy household articles (one set of cloths and set one of vessels). The SSK team with the help of administration, public, Digital Literacy Students, SSB Officers and Jawans raised Rs 12,000/. 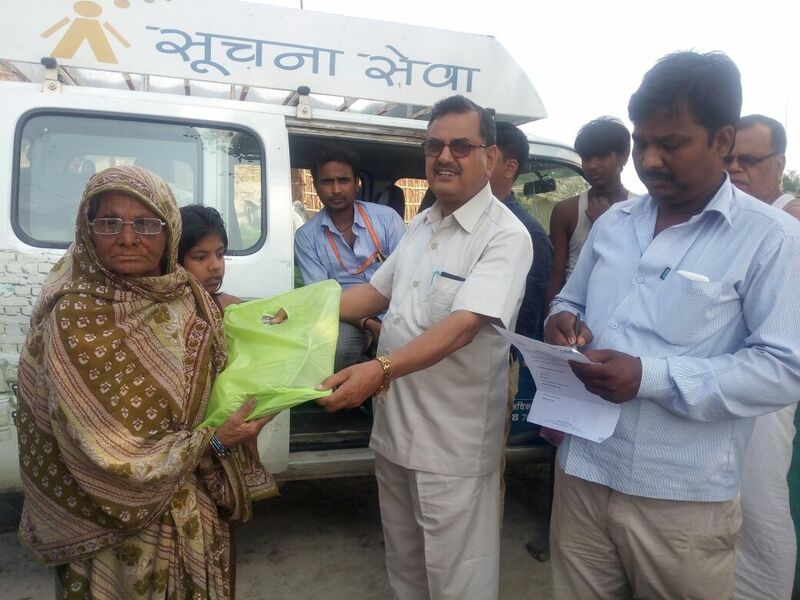 The team distributed the articles bought for villagers in the presences of Shri. Nagena Prasad, Lokpal (NREGA) Govt. of Bihar.